This salt soap recipe or 'spa soap' is wonderfully creamy, and while it has a high percentage of coconut oil and salt, it also has a high super fat to counteract any drying effects. Decorated with grated bits of bright blue/green soap and filled with fine sea salt, it feels like using a foaming polished stone to wash with. Quite intriguing! The addition of titanium dioxide gives the soap base a solid white backdrop to show off those pretty blue green bits and it is scented with the bright, crisp aromas of Lavender, Eucalyptus and Rosemary. Distilled Water - 237.6 gr. | 8.38 oz. Lye - 102.15 gr. | 3.6 oz. Sea Salt - Fine - 576 gr. | 20.32 oz. Grated coloured soap bits - 300-400 gr. For basic instructions on how to make homemade soap, read the 'How to make soap' page and incorporate the directions below to make the Salt Soap. Bring your soap base to a light trace and then add in the orris root and titanium dioxide. Be sure to mix in well. Add in your essential oils, soap bits and salt. Bring soap to a medium trace. Pour the soap into the prepared soap mould and insulate as normal. As soon as the soap reaches a full gel, take off the blankets and allow it to cool. This soap should be cut as soon as it has firmed up enough to be handled. For me, this was about 12 hours after making it. The soap was fairly firm but still warm to the touch. 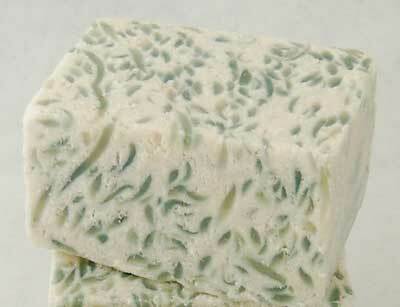 If left too long the soap will harden and you will not be able to cut it without it crumbling apart. Have some fun and experiment with different salts like Himalayan salt or try adding in some mini soap balls or chunks for variety.